Ever wonder what the AliasFor property on a table field is used for ? It is actually a pretty nifty little feature of the AX runtime. 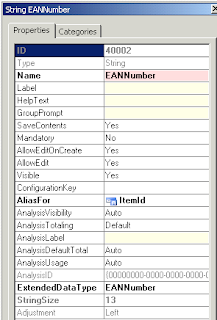 * Introduce a new field on the item table that can hold the EAN number of the item. 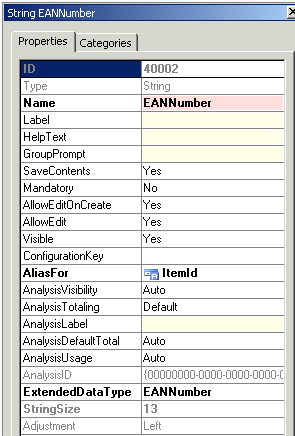 * Enable the user to be able to type in either the item id OR the EAN number when searching for an item to put on e.g. a sales order line. This actually quite easy to do. First I created the EAN number field on the InventTable using a new extended datatype created for that purpose. Then I created a new index on the InventTable containing the new field. This of course makes for searching for EAN numbers effeciently, but it also makes the EAN number field appear in the lookup list. The final thing to do was to set the AliasFor property of the new EAN Number field to be an alias for ItemId, by assigning the value ItemId to the property. Now "magically" the user is able to type in both item id and EAN number in the Item ID field of e.g. a sales order line, or an item journal etc. to get the item number. So the AliasFor property can be used to enable the user to use more fields as search keys when directly typing in keys in a field. it's not done by "magic"
(validate on the control, validate on the datasource-field and validatefield on the table). the first hit will be used. Dynanics AX - WTF ?